Tomato Disease: Early Blight, Late Blight, or Septoria? 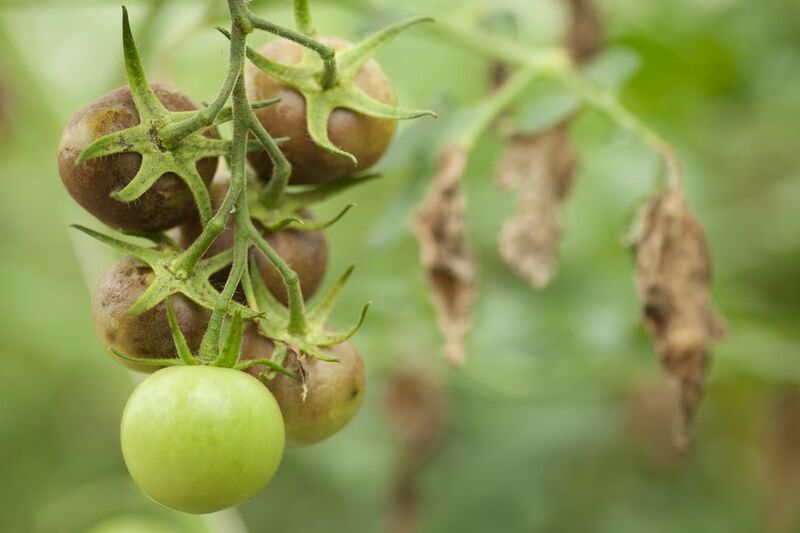 Tomato diseases are often weather dependent and can spread rapidly among tomato plants. While the cause may be out of your hands, there are remedies if you can identify which disease your tomato plant has been struck with. If you think you in the midst of a tomato disease, the information in the table below will help you determine which tomato disease you are dealing with. The symptoms of early blight, late blight, and leaf spot can be very similar, but if you know what to look for, you shouldn't have much trouble figuring out what you are dealing with. Included in the table are some well-known organic treatment methods for each type of disease. As you treat your tomatoes, take caution with any gloves and tools you are using. They can cross contaminate the fungus to other healthy plants, quickly moving through your garden. If you are treating or working with the molded plants, be sure to clean your tools and gloves after gardening. This will prevent spreading the fungus to healthy plants. Description of Foliar Damage One or two spots per leaf, approximately ¼ to ½ inch in diameter. Spots have tan centers with concentric rings in them and yellow halos around the edges. Spots start out pale green, usually near the edges of tips of foliage, and turn brown to purplish-black. In humid conditions, a fuzzy mold appears on the undersides of leaves. Numerous brown spots appear on the leaves, approximately 1/16 to 1/8 inch in diameter. The spots lack a yellow halo, and, upon close inspection, have black specks in the center. Description of Fruit Damage Dark, sunken spots will appear on the stem end of fruits. Brown, leathery spots appear on the top and sides of the green fruit. In humid conditions, white mold also forms. Fruit is not affected, though sunscald on the fruit can be a problem due to foliage loss. Description of Stem Damage Dark, sunken cankers at or above the soil line. Black and brown spots appear and spread. Entire vines can be killed very quickly in periods of high humidity. No stem damage. Optimal Conditions High humidity, and temperatures above 75 degrees F. High humidity, temperatures between 60 and 80 degrees F. High humidity, temperatures between 60 and 80 degrees F.
Organic Treatment Remove lower leaves after first fruit sets, remove affected leaves as they appear, plant tomatoes in a different area next year. Pull and destroy the plant, select resistant varieties next year, and plant tomatoes in a different area of the garden. Remove infected foliage as it appears, clean tools before moving to another plant. Plant tomatoes in a different area of the garden next year. If you find it helpful, you can examine photos of tomato diseases to help determine exactly what is afflicting your plants. Images of late blight and tomato leaf spot are a starting point when looking for the culprit of your damaged or dead tomato plants. If this chart proves unhelpful in determining the cause, take photos or actual leaves (in a sealed plastic bag) to a garden store. A knowledgeable employee should be able to help determine the cause of your tomato woes.